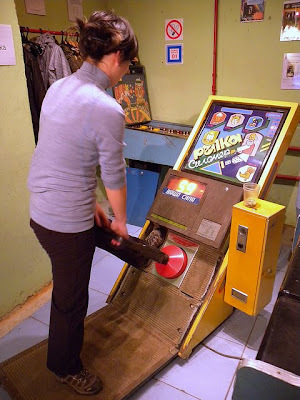 Turnip Strength Tester, a Soviet arcade game where one attempts to pull a stand-in for a turnip from a stand-in for the ground. Available for play at the Museum of Soviet Video Games. This is not a jape. That museum is infinitely cheerier than the North Korean Arcade, which hasn't even a mangelwurzel, real or fake.